If you live in sub-Saharan Africa, Latin America or the United States, you are more likely than people in other regions of the world to say you’re having a particularly good day. For the past several years, Pew Research Center’s annual Global Attitudes Survey has started with the following question: “How would you describe your day today – has it been a typical day, a particularly good day or a particularly bad day?” In 2017, we asked this question of nearly 42,000 people in 38 countries around the globe. Although most people worldwide described their day as typical (median of 62%) and relatively few described it as particularly good (median of 30%), people in sub-Saharan Africa and Latin America were more likely to view their day positively. Roughly half of Africans (median of 49%) and Latin Americans (48%) surveyed said their day was particularly good. Other regions – especially Europe (73%) – overwhelmingly described their day as typical; only 22% of Europeans said their day was good. The share of upbeat people was notably higher in several countries surveyed. Half or more responded that their day was good in Nigeria (73%), Colombia (61%), Ghana (60%), Brazil (56%), the Philippines (53%) and Peru (50%). The U.S. stands out for its positivity among Western countries, with 44% saying their day was particularly good. American conservatives (48%) and moderates (47%) were significantly more likely than liberals (34%) to describe their day as good. Why would we ask such a conversational question as part of an in-depth research project? As survey researchers, we spend a lot of time thinking about how best to write and organize our questionnaires. We kick off the Global Attitudes Survey with this type of question for a couple of reasons: First, asking people about their day is a pleasant way to start an interview, and it helps build rapport between the interviewer and respondent. Second, starting with an easy-to-answer question helps respondents get comfortable with the format of the survey. As the survey continues, we introduce more difficult questions – but still make an effort to intersperse easier or more interesting questions among the harder ones. Perhaps surprisingly, responses to this question were negatively correlated with one measure of national well-being, the United Nations’ Human Development Index (HDI). Countries with higher HDI scores have, on average, higher gross national income per capita, longer expected lifespans and higher educational expectations and attainment. 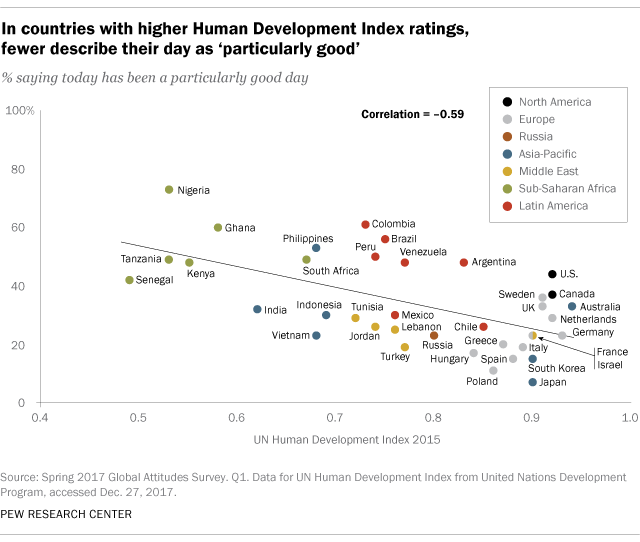 Yet people in countries with higher HDI scores are less likely to say their day has been particularly good. In 2014, we similarly found that a country’s GDP per capita was negatively correlated with the percentage of people who said their day was good. Note: See topline results of our survey and methodology.